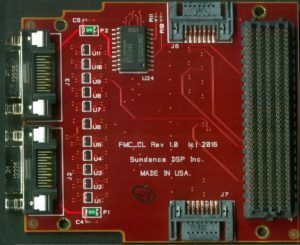 Products – Sundance DSP Inc.
Standalone Frame grabber module with FPGA and ARM processor running Linux. Can transfer the captured images to host running Windows via Ethernet or write the image data to the SD card. FG600-CL is a PXIe format, FPGA based imaging solution that supports BASE, MEDIUM, FULL and Extended FULL CameraLink compatible cameras. The hardware is fully compliant with the PXIe standard and can be used in a PXIe chassis as well as in an embedded fashion. 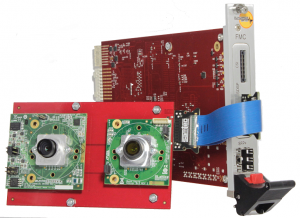 FG-650CL is an FPGA based imaging solution that supports BASE, MEDIUM, FULL and Extended FULL CameraLink compatible cameras. The hardware is a PC plugin card but can also be used in an embedded fashion. 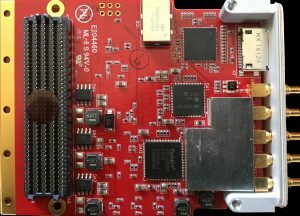 The DSP802.11S is a complete SDR development/demonstration system comprising a low-cost development hardware, software and firmware. FC802.11 is the firmware component of the solution for implementing 802.11 /a/b/g. Altitude Interference Mitigation Module (AIMM)is a complete Narrow Band Digital Beam Former System for communication in hostile environments, originally designed for US Navy. Dual channel RF module with 12bits digital IQ ADCs with a Virtex 5 FPGA (XC5VFX70T or XC5VFX100T) for processing. The system has a standalone carrier card with USB interface to host PC for application development. The solution also offers two dual-band 50 Ohm antenna ports for each channel. 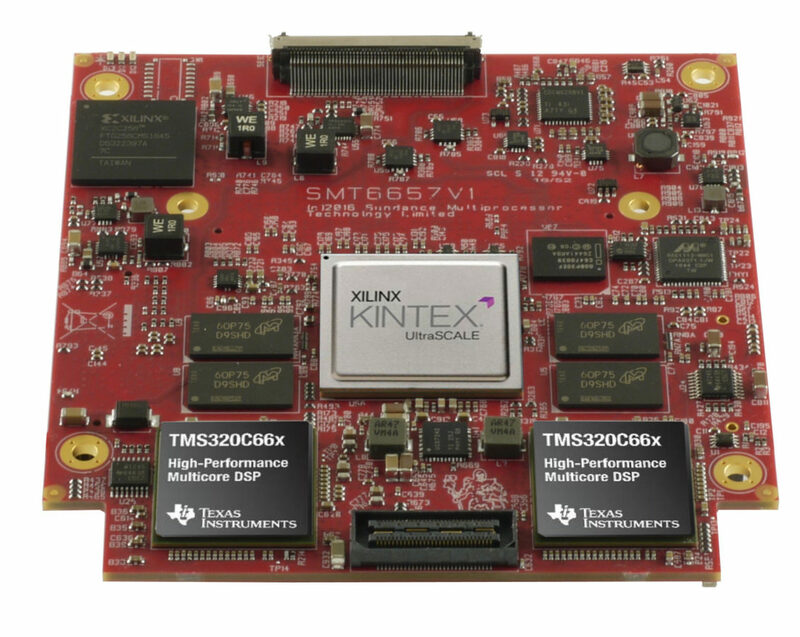 SE125 is a low profile, 8 lanes PCIe card powered by the Xilinx Zynq Utrascale+ MPSOC (XCZU7EV-2FFVC1156E. 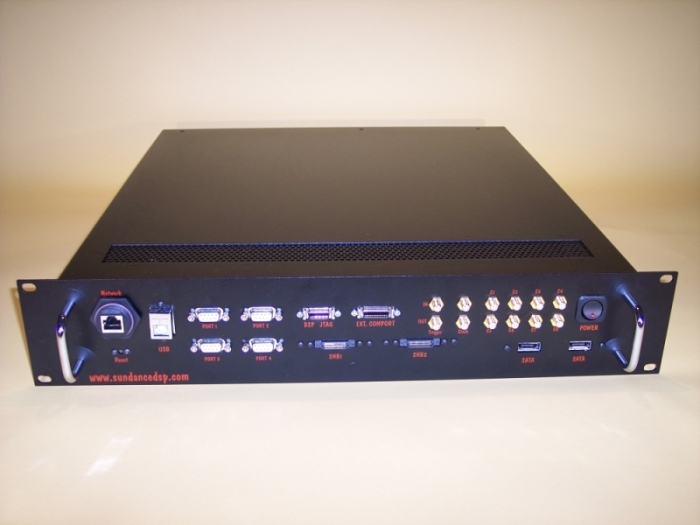 Designed for Data Center application for simultaneous 4K video encode/decode4K video streaming . 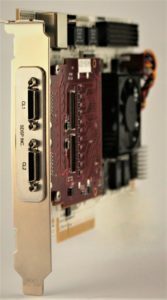 The onboard Zynq supports integrated H.265 hardware encoders and decoders. FMC-SDR400 is a conduction cooled Dual RF multiple input/output module (MIMO) based on AD9361, 70MHz - 6GHz RF transceiver and AD9656 ADC for baseband sampling of less than 70MHz (input only in this range). 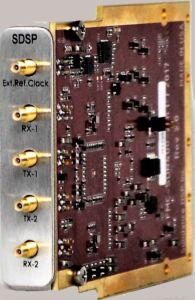 A software delectable gain and tunable RF bandpass front-end section provides high RF sensitivity by allowing rejection of out-of-band-of-interest interfering signals. FMC-GPIO68SE, Conduction cooled HPC GPIO FMC with 68 Single Ended IOs with 3.3 and 5V tolerance. FMC-GPIO is a an FMC module that can act as an IO interface for an FPGA board with HPC or LPC FMC sites. FMC-DAQ2P5 is a JESD204B compliant module. 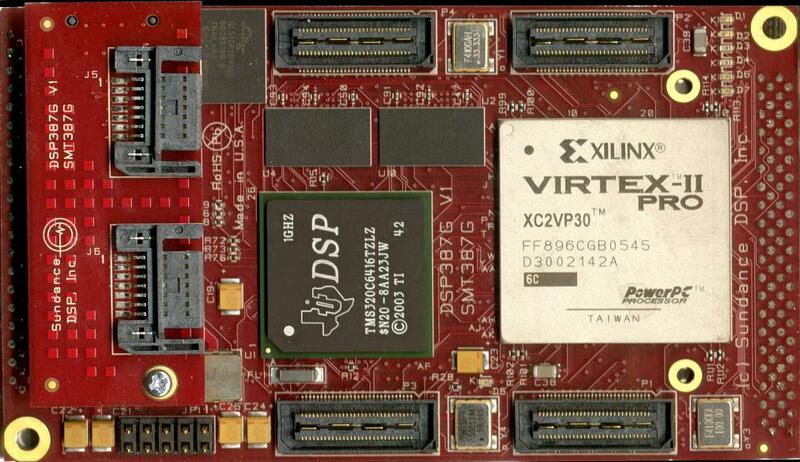 Conduction cooled Virtex-5 FPGA PMC/XMC module in FF1136 package, 16-bits 130MSPS Quad Channel ADC and Freescale MPC8548E processor supporting PCI-X, PCIe and PPC at 1GHz. 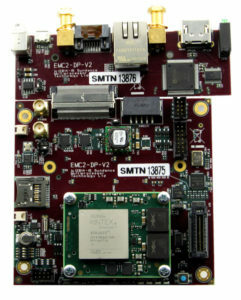 E125 is based on the Xilinx Zynq Ultrascale+ MPSoC. 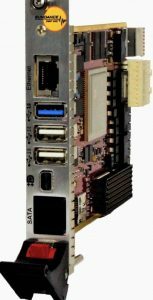 This is a low profile 8 lane PCIe card specifically designed to support Data Center applications. 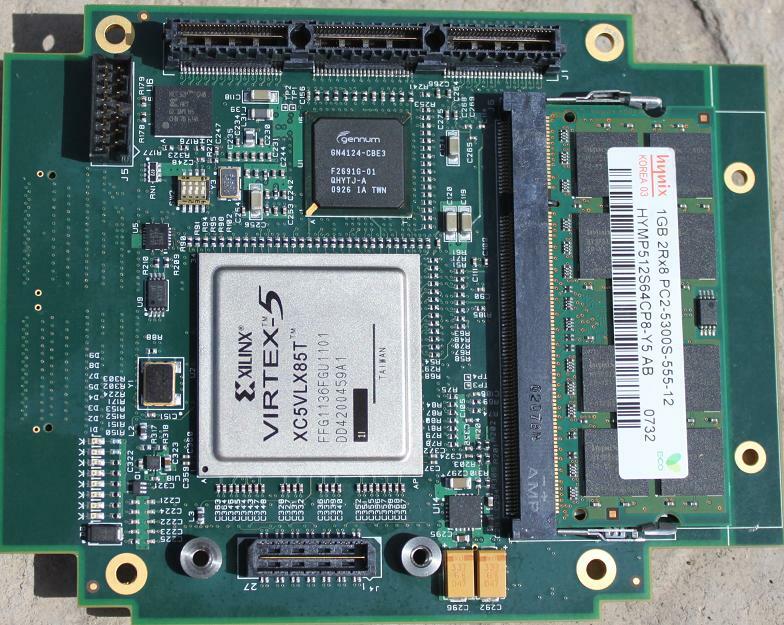 When XCZU7EV-2FFVC1156E is populated then the board can be used for simultaneous video decoding/encoding up to 4K resolution, and with XZU11EG it will be better suited for network acceleration. 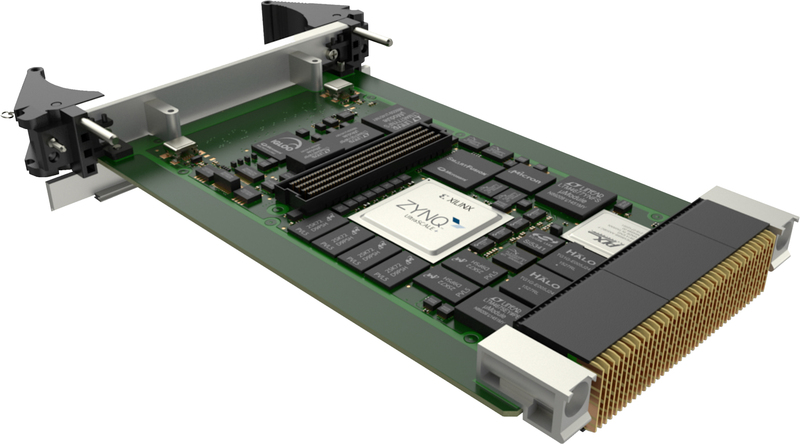 The EMC²-DP is a PCIe/104 OneBank" Carrier for Sundance SOM3 module based on PolarFire. 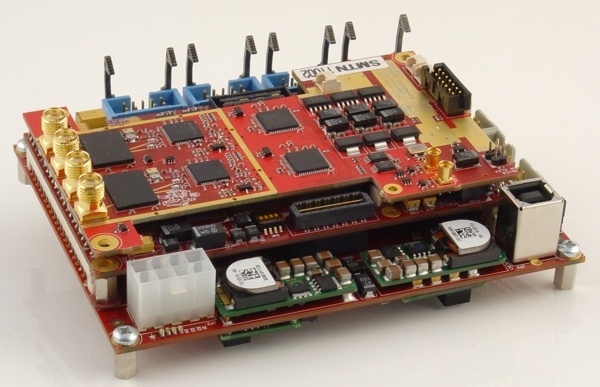 It is also compatible with Trenz SoC Module and has expansion for a VITA57.1 FMC" LPC I/O board and also has I/O pins, using a 100-way Samtec RazorBeam connectors system. 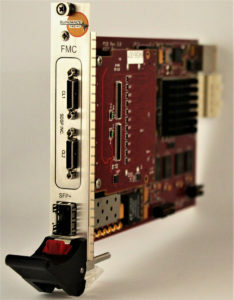 DSP-PCIe/104 is a ruggedised industrial grade PCIe/104 XC5VLX85T-1FFG1136 FPGA card with 1 lane of PCIe interface to host computers. This module can be attached to a custom neighboring PCIe/104 card acting as a daughter module. It comes with an XC5VLX85T. 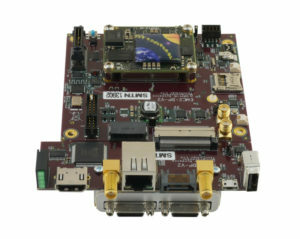 PXIe800Z complies with the latest PXI standard and carries a Xilinx Zynq Ultrascale+ MPSOC, an extensive amount of memory attached to the ARM processors and also to the Programming Logic (PL) part of the Zynq. 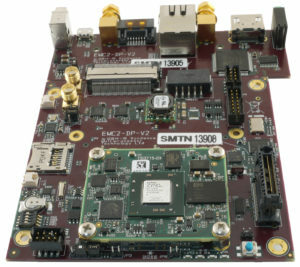 This board although, in PXIe form factor, but can be used as an embedded SBC solution with integrated programmable logic. PXIe700 is an expandable hardware, which is fully compatible with PXI-5 and ANSI-Vita-57.1 FMC carrier standards. PXIe is the platform of choice for the test, measurement and instrumentation market. PCI Express conduction cooled XMC module with 2x C6416T @ 1GHz,VirtexII-Pro XC2VP50FF1152, 2xSHB Interface,7 Rocket IO RSL interfaces. Conduction cooled PMC/XMC module with 2x C6416T @ 1GHz,VirtexII-Pro XC2VP50FF1152, 2xSHB Interface,7 Rocket IO RSL interfaces. 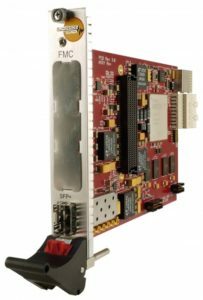 The FC118 FPGA IP core provides a high-resolution complex Fast Fourier Transform (FFT) function in a resource-efficient high-speed streaming implementation. 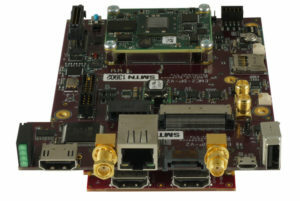 This highly-customizable core is ideally suited for channellizing applications such as Software Defined Radio, SDR, and sophisticated audio processing. Highly flexible interface for communication using Serial Front-Panel Data Port protocol. 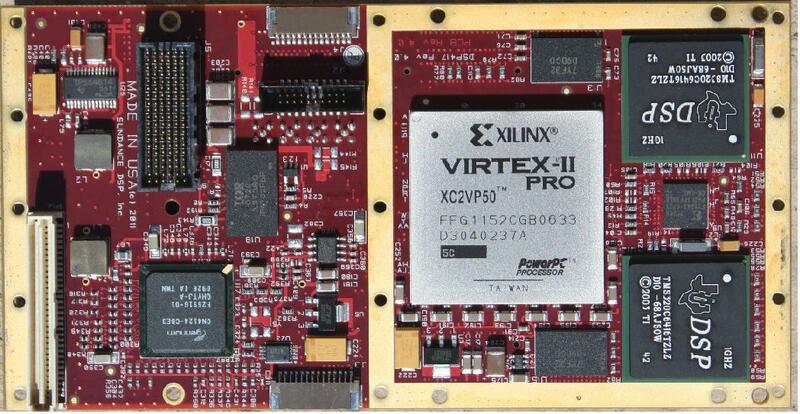 Optimized Digital Down Converter Core for Virtex 4 and Virtex 5 Xilinx FPGAs. Fixed Point FFT Processor Core for FPGA. Standard Offset/Gain/Delay correction - FPGA IP Core. Quadrature Conversion Algorithm - FPGA IP Core. Power Spectrum Extraction/Exchange of a digital signal. 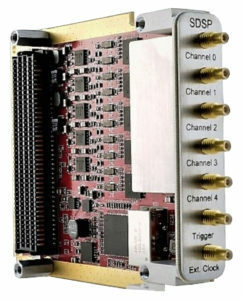 FC203B Power Spectrum Interleave - FPGA IP Core. 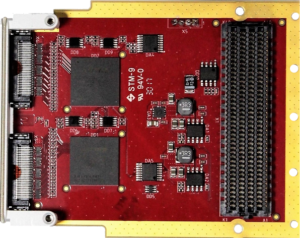 FC300 is an FPGA IP core implementing the complete OFDM physical layer, based on 802.11a/g/n. 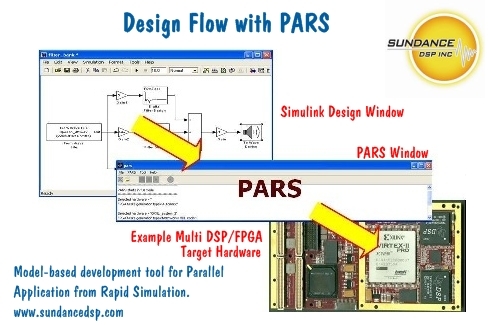 Simulink - Simulation and Model-Based design tool for Multi-DSP Multi-FPGA system. 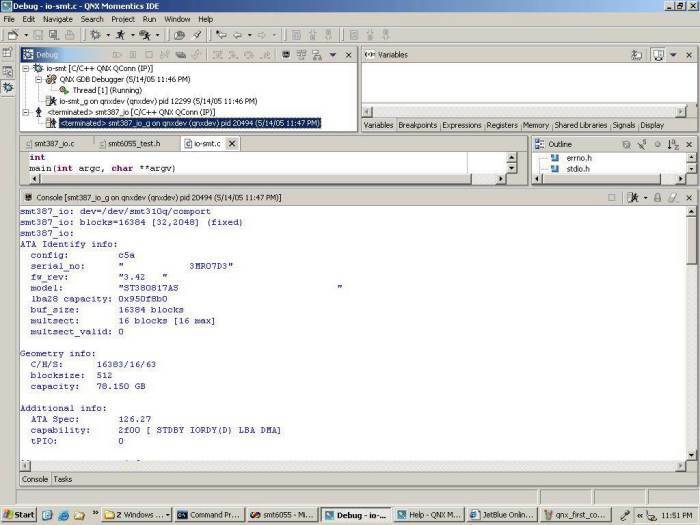 Labview interface to parallel DSP and FPGA hardware. Universal target services for Sundance hardware. FAT32 Filing system library for the DSP387 and DSP387-G disk storage module. Board support package for DSP387-G and DSP387 disk storage module. 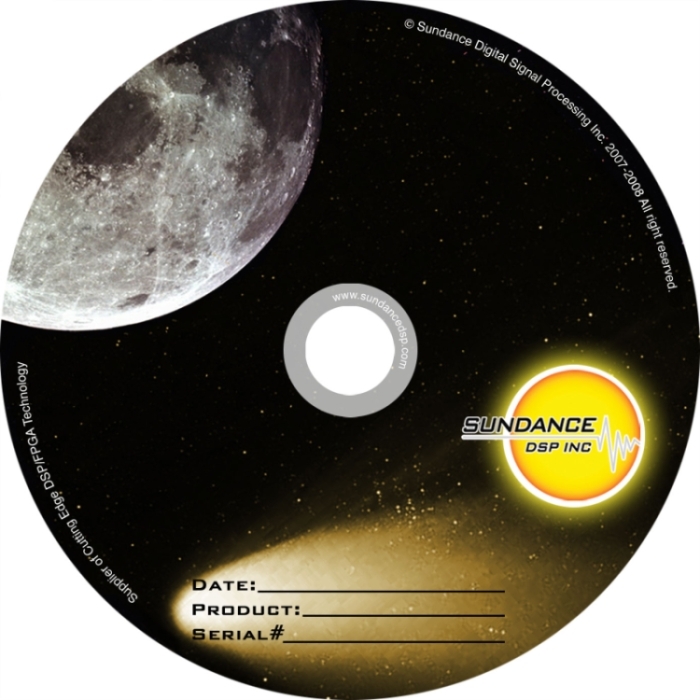 QNX Host-side software interface to Sundance hardware. 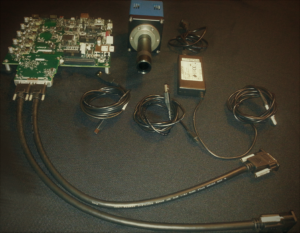 Embedded DSP System for data logging. Originally designed for a US Air Force application through General Dynamics. 2U Rack-mountable enclosure for embedded systems. 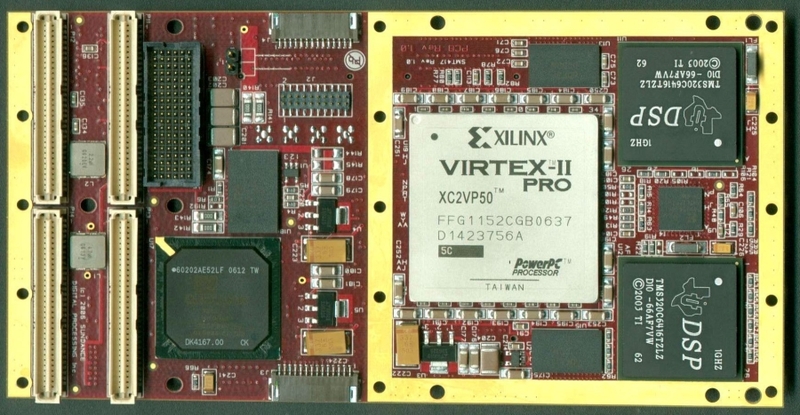 Dual Virtex-4 FPGA hardware module in FF1148 package with plenty of I/O's.